Harland and Wolff, the revolutionary builders of the Titanic and her sisters, combined with the prestigious White Star Line made enormous headway in the maritime industry. And inadvertently created a disaster, as we remember the sinking of the Titanic today. April 15, 2012 marks the 100th anniversary of Titanic. The ship herself is disappearing, as she decays and is ‘eaten’ over two miles below the Atlantic surface. Some of you may remember that my first post was on the Titanic, so I won’t rehash the event, sad as it was. Born in 1831 in Scarborough, England one has to question if anyone would ever foresee Edward Harland’s brilliant future. Harland lacked enthusiasm for classrooms, frequently wandering away from school to workmen go about their duties. In the process of his wanderings he learned a great deal. But much of his time was spent observing the ships of sail taking shape. Both of his parents were something a kin to tinkers, his mother often helping her husband with projects. But that was their recreational pursuits. Harland’s father, William, wasn’t thrilled about his son pursuing an engineering profession although that was what the boy wanted. The elder Harland saw no future in it and preferred his son go into law. In the end he gave in. In 1846 Edward Harland was apprenticed to a factory where he learned his trade with all competence. Five years later he had finished his apprenticeship. Harland rose the ranks of his profession and by 1854 had become a manager at a Belfast shipyard where he was given a rather free hand at running things by his employer. In 1857 the ambitious Harland was looking to establish his own shipyard. He tried to do so in Liverpool, but authorities would not allow him. So to Belfast he went. Aid came from a distant relative, Gustav Schwabe who had taken a liking to Harland. He helped to launch Harland into the business. Also joining forces with Harland was Schwabe’s nephew Gustav Wolff who would later go on to become Harland’s partner, forming the legendary Harland & Wolff shipbuilders. Harland and Wolff’s big break came with the White Star Line. In 1869 Schwabe had come to an agreement with Thomas Ismay, owner of the White Star Line. 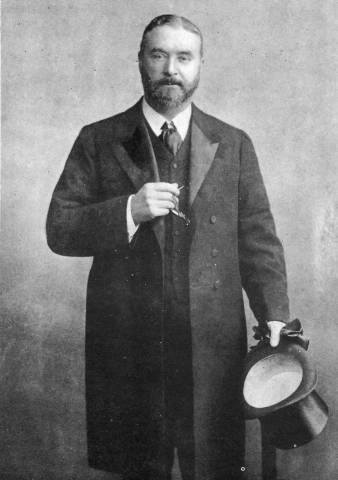 Earlier Schwabe had helped Ismay to purchase the bankrupt White Star Line. The agreement meant that Ismay would manage a new fleet of transatlantic steamers, Harland & Wolff construct the ships and Schwabe provide capital. The deal was struck and the foursome were on the road to success. Each held a considerable sum of stock in the newly formed Oceanic Steam Navigation Company LTD., owner of the White Star Line. Thomas Ismay had, since a child, possessed a love for the sea and as a teenager had gone to sea. It was brief stint, however, as he learned how truly dangerous and monotonous shipboard life was. Once back home he decided to settle for a shore based maritime job. 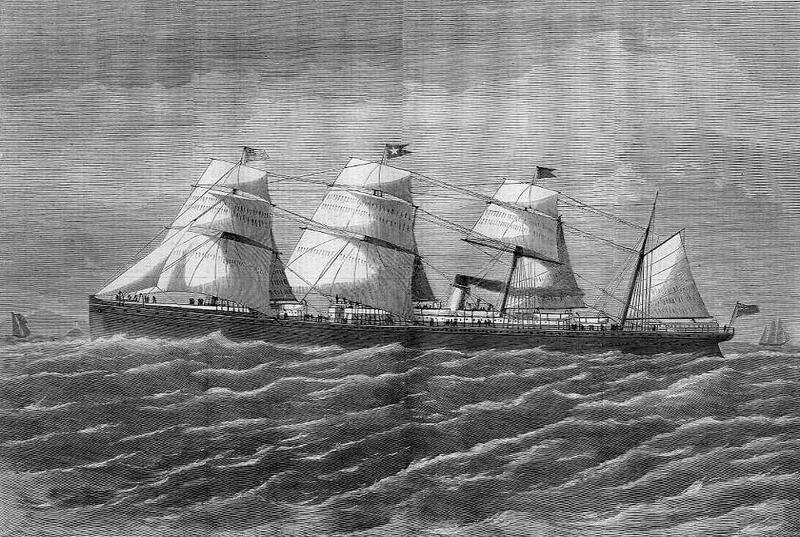 The partnership’s first transatlantic streamer was the Oceanic, launched in 1867. While built to compete with the popular Cunarders, she was also a luxurious and comfortable ship. Modern innovations had been enacted providing for the passengers every comfort and need. The maiden voyage drew crowds in New York. The size and accommodations were baffling, a far cry from sail. Soon the competition was on. While there was the usual public denial of such shenanigans, the White Star, Cunard and Inman lines were in a race for speed. Although they may have spouted that safety, and not speed, were top priority it would seem otherwise. The faster ships drew many passengers and also won important government contracts to transport mail. In 1872 the US gave the White Star Line the right to carry Saturday New York mail. Meanwhile there were many skeptics of the radical, narrow ships. Harland & Wolff seemed to be pushing the limits, they thought. The ships were treacherous and skeptics held on to the deep foreboding that something terrible would happen as a result of their design. They got their disaster in 1873. The Atlantic was carrying about 1,000 people and headed for New York when she was caught in bad weather. The ship began to run low on coal, thanks in part to the weather. Also the coal was of poorer quality, due to a coal strike. The captain worried that they would not be able to get into New York on time for the mail and have to pay a hefty fee. He decided to head for Halifax. It proved a fatal choice. Poor navigation ended the Atlantic’s and about 585 people lives. The Atlantic had run into a rock on April Fool’s Day. Harland died in 1895, but Wolff outlived him by eighteen years. In 1899 Ismay died leaving the business to his son Joseph Bruce Ismay. 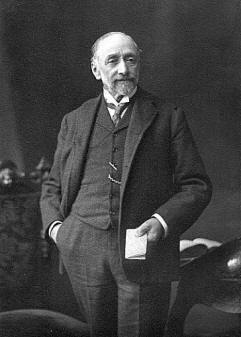 William Pirrie, who was born in 1847 in Quebec, was the chairman of Harland & Wolff. In 1874 he had become a partner in the business. By early 1902 J. Bruce Ismay had sold the White Star Line to the International Mercantile Marine (IMM), making American Millionaire J. P. Morgan the owner of White Star. Although there was a change of hands Ismay remained on, becoming president of IMM. In 1907 Ismay and Pirrie had come up with the idea of the Olympic-class ships. They would be large, top of the line ships, concentrating on luxury. While competing with Cunard, the ships would not be designed for speed although they would maintain a satisfactory rate. These ships were the Olympic, Titanic and Gigantic/Britannic. In 1910 Olympic was launched, Titanic following a year later. By 1912 Ismay was already giving serious thought towards retiring and a date had been set when he would do so. After the Titanic disaster the desire would only be strengthened as the public criticized his actions. Many were angry that he had gotten away from Titanic in one of the few lifeboats when so many women and children had perished. The disaster itself came as quite a shock to the world, shaking it to the core of its trust in technology. The White Star Line later chartered the Mackay-Bennett to retrieve the bodies still out on the North Atlantic. Incidentally many bodies were never recovered. The tragedy effected the White Star Line greatly in the financial world. Lawsuits were endured through 1916 when a judge decreed the cases’ end. In 1924 Pirrie died of pneumonia. On May 10, 1934 the White Star Line and Cunard merged to form the Cunard-White Star Line LTD. Cunard later bought the White Star Line out. Today they offer White Star service, but the only thing that exists physically today of White Star’s legacy is Titanic’s tender, Nomadic. Harland and Wolff is operational till this day. For further reading consider Transatlantic by Stephen Fox. It’s an enormous book and very extensive. Brilliant post – thank you for taking the time to write it 🙂 Always a pleasure. And thank you. It’s nice knowing that people enjoy the posts. Thanks for reading! Thank you for your continued comments on blog throughout this whole month! I enjoyed reading your thoughts and found them interesting. Now that I’m done with my day-to-day blogging, I look forward to reading the blogs of some of the people I met along this experience. Your blog is a new favorite of mine! There are a lot of articles here for me to read and learn from. I did not know about the Atlantic’s story… what a horrid coincidence that almost 600 died on April Fool’s Day. What a day to die on! I mean that in the most sympathetic way. Anyways, I’ll be checking in on your posts. Keep up the excellent writing! Oh, and I’ve got to put “Transatlantic” on my booklist to read sometime. Thanks for stopping by, always nice to hear others thoughts about the posts. As a fellow homeschooler, even more so. I’m glad you like the blog. I’m looking forward to more posts on your own blog. Yes, the Atlantic story is an extremely sad one. Such a terrible loss of life. Great read for this morning. Thanks! Wonderful writing, JG. It serves us sometimes to take a step back from the minutiae of he disaster itself, all those emotive details, and see it in the context of the wider shipping world. I loved this. Thank you, and yes it does. It is almost mind boggling how quite a ways ships have come. From the type of ship Christopher Columbus sailed to the RMS Queen Mary 2. Thanks for your comment. It always amaze me how history throws together these groups of brilliant minds! The legacy never seems to tarnish… even after mishaps, disasters and their passing! Of course it does help that the White Star Line did make efforts to “quiet down” disasters such as Titanic. I like to see how the various chain of events contribute to well-known happenings. Little details but look at the outcomes! Thank you for taking the time to stop by. I’m happy to know that you’re following and enjoying. Happy new year to you too! Haha! Well I am very glad to hear that. It’s comments like yours that keep me from giving blogging up altogether. So thanks for sticking by MoT, greatly appreciated. Have a great weekend.